Move over Little Shop, there’s a new collectables craze at Coles – Stikeez! After the supermarket chain’s wildly successful Little Shop campaign last winter, featuring miniature versions of 30 popular grocery staples such as Weet-Bix, Vegemite, Milo and Nutella, followed by a Christmas edition in December, Coles is at it again. This time around the promotion focuses on healthy eating, partnering with the Healthy Kids Association in an effort to influence kids to eat more fresh produce. From Wednesday, February 13, customers can receive one free ‘Stikeez’ for every $30 spent in Coles stores, online, or at Coles Express. With 24 Stikeez to collect, shoppers can expect to pay a minimum of $720 for the full set. ‘Stikeez’ are miniature figurines of fruits and vegetables with tiny arms, legs and faces. They come with names like Ava the Apple, Cooper the Carrot and Billy the Banana. 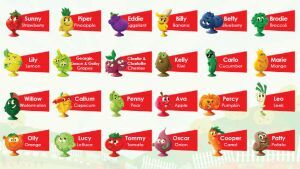 There are three Stikeez named after actual Coles producers, including Marie the Mango (which represents Marie Piccone from Manbulloo in the Northern Territory), Carlo the Cucumber (showcasing Carlo Pippo from Fresh at Heart in Ballina, NSW) and Sunny the Strawberry (named after Sunny Ridge Strawberry Farm in Main Ridge, Victoria). “This campaign is all about healthy eating and trying to get kids to love their fruit and veggies,” said Coles spokesperson Martine Alpins. “This is more than just about collecting Stikeez, it’s about getting kids to actually want to try new fruit and veggies. “It’s a really great campaign, which is celebrating fruit and veg and bringing them to life, so that kids and their parents can be encouraged to eat more fruit and veggies. In addition to the Stikeez collectables, customers will find a free Rainbow challenge poster in stores with a checklist, which aims to encourage families to track their fruit and vegetable intake by crossing off the fruit and vegetable colours of the rainbow daily. 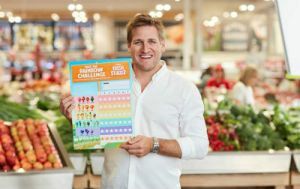 Coles Fresh Ambassador and celebrity chef Curtis Stone has also created easy-to-prepare recipes for kids to make with their parents. Coles Chief Operating Officer, Greg Davis, said he expects the new craze to be a hit with families. Stikeez collector cases will be available for $4, along with a range of drink bottles, snack boxes, plush toys and pouches also available for purchase. For the ultimate collection, keep a lookout for a see-through Brodie, glow in the dark Carlo, a sparkly Cooper, metallic Eddie and the rarest Stikeez of them all – Golden Billy Banana! With the Golden Banana, you also score a Coles $100 voucher.